There are two versions of the Pilgrimage to Cythera. After winning the scholarship of the Prix de Rome, the artists are commissioned to paint a “reception piece”, it is, a painting that would prove the artist’s skill and commitment in front of the public. 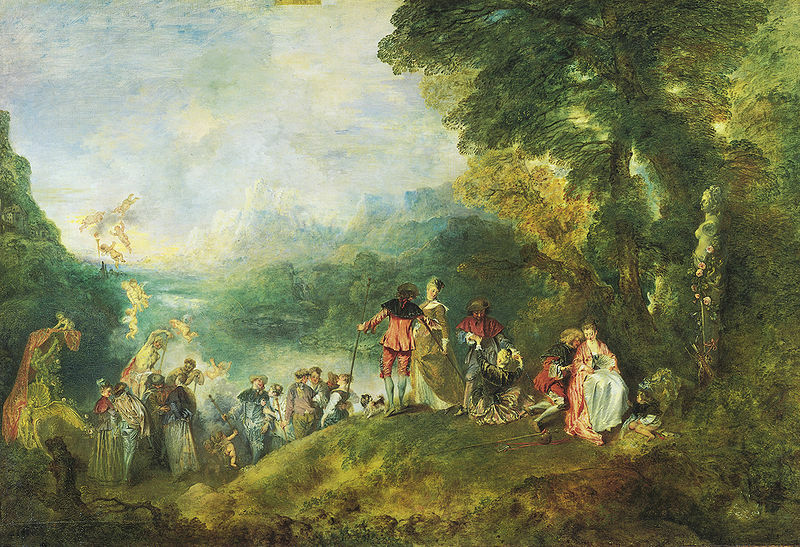 Watteau then works for 5 years until he finishes the first version of the Pilgrimage to Cythera in 1717. This painting was a success so, they requested him a reinterpretation of the motif, which finishes in 1721. 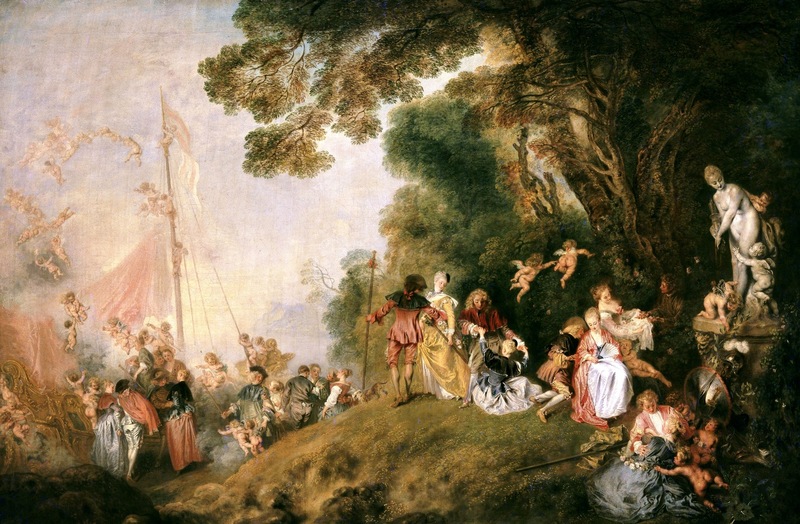 The second version of the painting is much more representative of Watteau’s rococo. While the composition of the first is relatively simple, in the second version is much more ornate. On other hand, the landscape of the 1717 painting is unequivocally more realist than in 1721 version, which is completely idyllic. Cythera is an island in southern Greece, known as the birthplace of Venus, the goddess of love. In both Watteau’s paintings, we will see several couples seducing themselves in a dreamy environment crowned by an army of putti (Cupids), who fly across the place and intervene in the relationships of the characters. It isn’t clear if the couples just reached the island or are departing from it. Several times they asked Watteau about this, but he would never clarify it, probably because it is not important: it isn’t necessary an interpretation of the paintings to understand them as what they are: allegories of courtship and romance. ~ by Álvaro Mazzino on June 8, 2011.
in the early hours in the break of day, because i like to learn more and more. stream. These creams are safe and extremely efficacious. The playing cards and their positions may not appear to link. I recommend ordering a cosmopolitan that contains Rain Natural Vodka. you may be obtaining married quickly. This entry was posted on June 8, 2011 at 11:48 and is filed under Rococo.You can follow any responses to this entry through the RSS 2.0 feed.You can leave a response, or trackback from your own site.